Since 1981 musicians, DJs, contractors and integrators have chosen Rane Corporation (rane.com) as an established innovator in problem-solving pro audio tools, affordably priced with unequaled reliability and customer service. Rane’s primary marketplaces are DJ (performance, club, mobile & recording) and Commercial (room-combining, paging and associated systems) featuring innovative analog and digital audio products for each category. Based in Mukilteo, WA, all products are designed and manufactured exclusively in the United States with worldwide product distribution. The Sixty-Eight is the ultimate plug-and-play package supporting four-deck digital vinyl simulation, software controls, two USB ports for easy DJ transitions and colloboration, software effects, six built in beat effects, and all the record and playback channels you need. 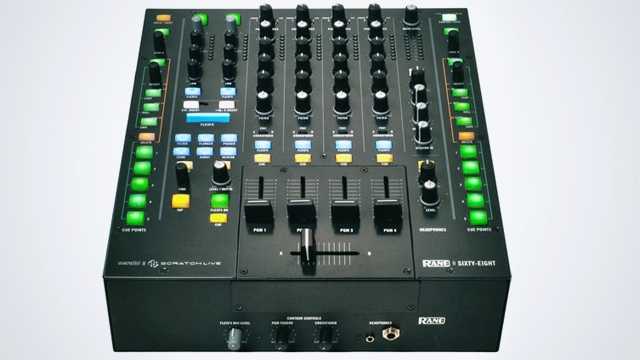 The Sixty-Eight Mixer supports both analog and Digital Vinyl Simulation (DVS) playback. The mixer is bundled with Serato Scratch Live and includes ASIO and Core Audio drivers for use with other audio programs. Armed with studio-grade phono preamps, USB and S/PDIF inputs, the Sixty-Eight allows a blend of analog and digital audio sources like never before. It features easy internal digital effects with on-beat effect switching, external analog inserts for hardware effects, and USB insert support for software effects.